With our combination of reliable service, attention to detail, and customer satisfaction, you can leave your item with our appliance repair experts knowing that it will be repaired to factory-like condition in no time! Our certified technicians can repair all major brands, makes, and models in a quick amount of time. The appliances that we service in-shop are stoves, ice makers, refrigerators, dishwashers, dryers, washing machines, window air conditioning units, wine coolers and more. 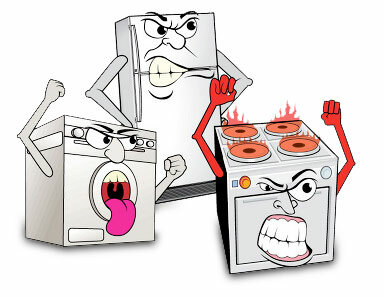 We guarantee our work on all appliances, earning us a reputation as Little Rock’s leading appliance repair experts. Additionally, our Central One warehouse has a well-stocked inventory of appliance parts in-shop, so we will have just about everything we need to repair your appliance to get it working like new. Our Central One technicians pride themselves on swift, courteous service with our decades of experience. Our prices are always fair, and don’t forget, we also offer senior and military discounts. Drop off your appliance with one of our friendly technicians today! Call to make your drop-off appointment now! Since 1977, we have provided outstanding appliance repair services in Little Rock and surrounding areas areas, including Conway, Cabot, Benton, Searcy, Hot Springs, Bryant, Lonoke, Morrilton, and Malvern. If you have a repair done by Central One, we will provide FREE service calls should you ever face a problem! You can always expect fast and friendly service from our appliance repair team. Dropping off appliances at the Central One warehouse is the convenient option, but more importantly, it’s cheaper! Finally, when you use our drop-off service, there is less labor and travel time and a lower upfront diagnostic fee, which all adds up to savings that are 35% less than if you use in-house repair. Get your friends to help you load your appliance onto a truck and bring it here. Then you can use the money that you saved to thank them or use it on yourself! If you would like to use our drop-off appliance repair service, please call (501) 835-3955 first to make an appointment. Come in at your designated time and a friendly technician will be there to greet you. You can either fill out this diagnostic form before you come in or fill it out in the store. We will also have you fill out some other quick forms and pay a small diagnostic fee upfront. Then we will have you bring the appliance around back to our bay and we will load it inside for you. You are then free to go while we do the work! We’ll hook it up and get it diagnosed to find the best repair option. We will contact you and discuss the problem in clear terms and answer any of your questions. After giving you the cost of repair, we can then get started. The whole process normally takes about one to two days before you get your appliance back in like-new, factory condition! *We hold items in our warehouse for up to 90 days after repairs are completed.